During Mahashivaratri this year, social networking websites were flooded with dancers hailing it as the day for dancers. This celebratory mood was understandable. According to myth, Shiva is the cosmic dancer. However, in order to explore whether Shiva has always been at the pinnacle of importance in dance, it is interesting to trace Nataraja's history in that context. Nataraja has played an important role in the South Indian religious tradition for centuries. He is seen in stone sculptures of Badami, and the beautiful bronze sculpture of Nataraja of the Chola era is famous today. Yet, according to Matthew Harp Allen, “Nataraja had never before been asked to play a role quite like the one reserved for him in the 20-century revival”, when Nataraja was accorded a central role. between the 17th and 19th centuries. The protagonists of these stories were Krishna or Murugan - two youthful, playful and romantic characters in Hindu mythology. On the other hand, Shiva is generally considered to be more severe than Krishna or Murugan, according to Kalanidhi Narayan. Shiva’s dance, for many, represented the cosmic destruction of all impurities. As Allen points out, it was during the ‘revival’ of dance in the 1930s that Nataraja becomes “both a patron deity for dance and a subject for portrayal in dance”. After dance moved out of temples, the Nataraja idol, over all other gods, began to be placed in the corner of the stage. Additionally, the number of compositions dedicated to and about Nataraja increased radically during the period of this ‘revival’. 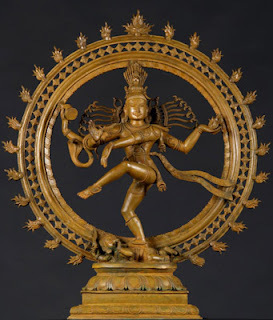 Old poems about Shiva and Nataraja that were previously performed as vocal recitals were brought into the realm of dance by choreographers in the 1930s and 40s. In fact, according to some, it is during this time, that ‘Natanam Adi Nar’, a currently celebrated kirtanam dedicated to Nataraja, became popular. It is said that Rukmini Devi always ended her recitals with ‘Natanam...’. Equally important in making Nataraja a central figure in Dance was Ananda Coomaraswamy, who wrote ‘The Dance of Shiva’. According to Allen, it has been the most influential publication in the 20th century popularization of Nataraja. Nataraja continues to be popular in the 21st century and stands today as an extremely important figure in the world of Indian dance, but clearly this was not always so. In fact, if Indian dance forms have existed at least since the first mention of Devadasis (around the 11th century) then Nataraja’s importance and centrality is incredibly recent. In that light, is it entirely appropriate to call Mahashivaratri the day for dancers in India? Indeed, can and should dance belong to any one particular god? This is baseless, and to put it mildly, rubbish. First, the Indian dance forms have existed much before that. Even if you consider the date of their first systematic documentation (Bharata's Natya Shastra), it is 1st or 2nd century *BCE*. The Devadasi system became prominent in11th century CE (Chola Era in Tamil Nadu), that just marks the glorious era of grand royal patronage to dancers, NOT the *starting* of dance forms. Second, Shiva as the supreme dancer has been mentioned in many ancient works in both Sanskrit and Tamil. Bharata Muni's famed Natya Shastra itself describes Shiva as the King of Dance. Silappathikaram mentions the dancers of ancient Tamil Nadu enacting out 64 forms of Shiva's rapturous dances, starting with "Kotukotti". Numerous sculptures in many great temples contain scenes of Shiva dancing in the center with musical accompaniments along with many Apsaras, Devas and Ganas dancing along with him. All these belong to 6th - 12th century CE, like the 108 karans in the doorways of Chidambaram temple, elaborate dancing scenes in Halebedu Shiva temple, group of Kakatiya temples in Warangal district of Andhra, Kailasanatha temple in Ellora etc. etc. etc. The hypothesis by Matthew Harp Allen and your article's premise are unfounded. Please refer to the seminal work "Nataraja, in Art, thought and Literature" by the eminent Art scholar Late Dr C S Shivaramamurthy (Pubication division, Govt. of India), ex director of National Museum in New Delhi. That book gives enormous amount of data and the correct perspective in this regard. So, the centrality of Nataraja in Indian Dance has very ancient and traditional roots. This is indisputable. Dr Ananda Coomara Swamy only reaffirmed it and highlighted it at the start of 20th century. He did not create or invent it. But why some Allen should take so much trouble to *prove* that Shiva is not a central figure of Indian Dance? That amuses and suprises me. What really is the motive? What one really gains by such assertions? Why not? Given the strong basis in Indian Dance and Art tradition, if artists wants to celebrate their art on this auspicious day, what is really the problem? Which other day, according to you, is more suitable, and more appropriate? Thanks for reading and giving your valuable feedback. I will certainly find and read the resource you provided in your email. Just to clarify some things. I never implied that dance forms have existed only since the 11th century. Since I had made a reference to the devadasis, I concluded by saying that since they had existed AT LEAST since the first mention of devadasis (documented reference of devadasis in the 11th century. For this, see Janaki Nair's article in EPW titled 'The Devadasi, Dharma and the State). This was not to say that the dance forms didn't exist before that. Lack of writing space, and perhaps a lack of clarity on my part lead to that confusion. I apologize for that lack of clarity and do hope that one day I will get more than 650 words to say everything that I wish to say in as much detail as I wish to say it. But I would appreciate if you wouldn't discredit my intelligence and Allen's academic credibility by calling it 'rubbish'. I am well aware of the dancing Shiva in the temples of Badami (I did mention this). As far as the Natyashastra is concerned, written sometime between 200 BC and 200 AD, there is academic speculation about whether Bharatamuni was even a real person or a pseudonym for a collective oral tradition documented over several years (I can provide you with academic references to this as well). Secondly, indeed..Shiva has been mythologically termed as the supreme dancer. I never disputed that he was and remains till today the cosmic dancer. I perform several Shiva and Nataraja pieces myself. I have nothing against the God. What interested me was how the nature of his importance and centrality changed with the changing social, political and cultural surroundings over Indian cultural history. Also, Shiva being the supreme or cosmic dancer still does not make him the patron deity for dance above all other deities, who are also extremely important and valuable to Indian dance forms. I do not think that Allen's hypothesis is unfounded. Perhaps you should read his entire work before you make that decision. The centrality of Nataraja having ancient and traditional roots, I do not dispute. In fact, I mentioned that Shiva had been an important figure in Indian religious traditions for centuries. His centrality in dance having ancient and traditional roots, however, is clearly not undisputed. As many, many dance scholars have many different view points on this, as an academic and dancer, I cannot disregard them all. Also, I'd like to ask you what you mean by 'correct perspective' with regard to Shivaramamurthy's work and on what basis you call it the 'correct' perspective. I have not read it, but I find the word 'correct' itself exclusionary, as it leaves no room for any other perspectives on the matter. I'd also like to take the opportunity to point out that my article never argued that Coomaraswamy's work invented or created this importance. I merely said that his book "influenced the popularization of Nataraja in the 20th century". I fail to understand why this troubles you. Finally, Allen does NOT try to prove that Shiva is not a central figure in dance. Unfortunately, I can only attribute your reading of his work and my article as careless and judgemental reading. In fact, he does the opposite. He hypothesizes the importance and centrality of Nataraja, but having noticed that this was not always so (it was certainly not so during the prime era of the Devadasis), he merely tries to explore and explain why this might be the case. Academic work rarely gives ultimatums. They merely allude to alternative ways of thinking, and to encourage debate and discussion. His motive? I think his motive was merely academic. What do you think his motive could possibly be? Surely you do not think he has something against Nataraja, or that I do? Neither of us has anything to gain from being against Nataraja or Shiva! I suspect Allen hopes to gain a rethinking into Indian dance, to give alternative perspectives to views that are taken for granted as true and 'undisputed', and to question things. These aren't bad things! After all, they create room for discussion, for exploration, for deeper understanding. This last line was edited by the editors at the Hindu. Lack of space, I suppose. But allow me to explain what I meant. I did not have a problem with dancers celebrating their art on this 'auspicious day'. I myself performed in Chidambaram last year for Mahashivaratri celebrations. My topic of interest was with dance being attributed to this one God alone. I had emphasized 'the' day for dancers in my draft. Dancers in India were hailing this as a day for dance all over the world. If it had been a day among many others to celebrate dance, I would not have been so troubled. I feel that hailing one day dedicated to one God as the day to celebrate dance seems restricting to me. First of all, what about the other gods? Are they not important? Why then can't Janamashtmi or Diwali be a day to celebrate dance? Secondly, what about Bharatanatyam dancers who belong to other religions? When do they get to have their day for dance - doesn't it exclude them in some way? Finally, what about other dance forms? What about people who don't believe in God? Are our Indian classical dances so exclusive that they cannot accommodate such dancers and patrons of dance? To answer your final question - I don't believe there needs to be any one particular day to celebrate dance or art. Any day and everyday is suitable and appropriate to celebrate the hard work of dancers, and the richness of our dance forms. I, for one, celebrate it every day and thank my stars all the time that dance is a part of my life! I hope this clarifies some of your doubts and leaves you less acrimonious. I do hope you keep reading my articles in the future.